What was the Inspiration for your wedding day? The inspiration for our wedding day was our shared home city/state. We both moved to Seattle from California and have chosen our life here in the Emerald City. Our location near Mt Rainier was a representation of all the beauty that Washington State has to offer, the magic and elegance of the forest. How and why did you pick your venue and or wedding details? I (Melinda) was researching outdoor venues in the Northwest and kept finding a photo of this small forest amphitheater, which was a dream. Turns out this image was an actual place and only a few hours away from Seattle and totally doable for us. 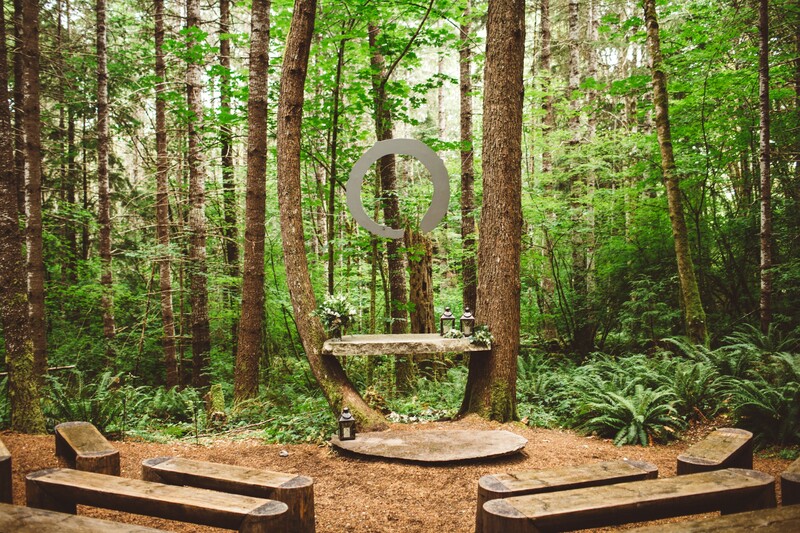 The wedding details were simple, we wanted to bring elegance to the natural chaos of the forest and we really felt like that came together as our message. We focused on the food quality, drink choices, and our top-notch vendors who were out of this world amazing. What special details did you include in your wedding or reception?? We honestly had a lot of details that were dampened by the rain of the day, which was what made it special in itself. Those little things didn’t matter as much as the lovely scene of our friends and family mingling, eating, drinking, and dancing. We let the day take on its own path and depended on the people that we love to help make it all work. It was an accumulation of our community coming together and nature having its own plan. It was a beautiful and loving chaos which was truly magical. How did you make your wedding day special and make it about the two of you??! We wrote each other letters for the day of and purchased little gifts. I (Melinda) wrote my letter to Stuart the morning of. I wanted the excitement and inspiration of my love that day to translate to him as he was preparing to take that next step. Stuart wrote me a gorgeous letter and purchased beautiful diamond earrings that I wear every day. We also stayed out of the set-up the day of and really tried to stay calm and allow our planner, who was also one of my best friends, to mitigate that stress. It made the day truly enjoyable for us. What was your favorite part about the wedding planning process? I think that I learned a lot from the process. It was full of challenges. I pushed myself to manage all the details myself and I prepared as much as I could, and the rest I left up to however it was going to fall into place. It was that relinquishing control that was a significant learning moment, trusting your community, closest friends, and vendors. Any advice for those planning now? Get help and don’t try to do it all yourself. Have a Day-Of Coordinator. It’ll never be exactly as you dreamed, instead it will become exactly what you needed. If you are at a location with no service, buy lots of walkie talkies. How was your experience working with The DeLauras?? Well first of all – Kendal is a long-time family friend of mine so I am totally biased and so thankful to have people that we love so much be involved on our special day. Anthony was a very welcomed addition to her already impeccable work ethic, they’ve combined forces to truly become a power team. I always know that if I give Kendal any task, at all, she never disappoints and raises the bar every single time. I can’t recommend the DeLaura’s enough for their professionalism, loving care, and the perfect product they produce. WE LOVE YOU!